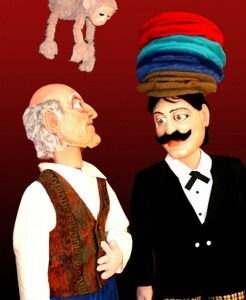 Two of your favorite stories, Caps for Sale and The Three Billy Goats Gruff, come to life on stage with all kinds of puppets, some of them larger-than-life! Help the peddler find his caps, and help big Billy Goat Gruff find his brothers. Watch the characters sing and dance their way out of trouble and into a world of happy endings. When plays or movies are adapted from books or stories, the playwright often makes some changes. Read the stories in class before you see the play. Be alert for changes and twists to the original. Which versions do you like best? Great way to inspire students to read, learn and write.